Could Club Cruise Still Survive? News came last week that Norwegian loan trustee Norsk Tillitsmann had been given approval by bondholders to force the sale of Club Cruises' ships after Club Cruise defaulted on payments. Unless some other solution is found, this looks like it may bring a rather unfortunate end to one of the more interesting European companies to have gotten involved in cruising in recent years. This news could also cause potential problems for operators, including Phoenix Reisen of Bonn, who have two Club Cruise ships on charter, and Saga of Folkestone, who have committed to purchase Club Cruise's Astoria. 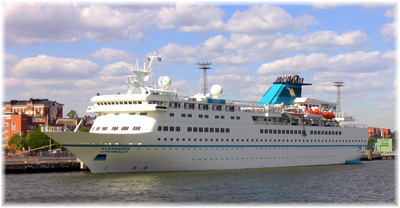 Club Cruise Entertainment & Travelling Services Europe NV, of Veenendaal, Netherlands, to give it its full name, began in 1999 with the purchase of the 727-berth Club 1, the former Odessa Sky, which had been built as the Gruziya. Beginning with short cruises in the Netherlands market, this operation failed but Club soon found an answer to this by chartering their ship out to other operators. At first she was chartered for cruises from Israel, but soon, renamed Van Gogh, she found work cruising for Nouvelles Frontieres of France. In 2002, this was followed by a charter to UK tour operator Travelscope, which lasted for a number of years. Unfortunately, this came to an end when Travelscope itself went out of business in December 2007. 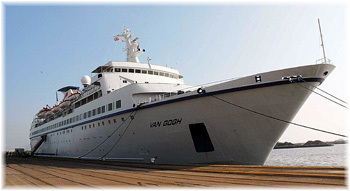 Briefly revived under Club Cruise's UK subsidiary Van Gogh Cruises, the Van Gogh completed her planned 2008 world cruise but closed shop in April. The Van Gogh was then chartered out to Russian tour operator Metropolis Tur for the 2008 season, working for them until last month, and is now in lay-up that had been projected to last until April 2009. While Travelscope had provided good employment for Club Cruise, even more important was Phoenix Reisen, to whom it now has two ships on charter. 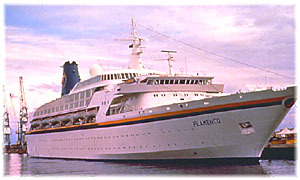 In fact, Club Cruise had purchased the 884-berth Albatros, one of the original Royal Viking trio (the other two are now owned by Fred Olsen Cruises as Black Watch and Boudicca) in 2006 on the back of a charter from Phoenix to replace its first Albatros, a former Sitmar ship that had been on hire from V.Ships of Monaco (V.Ships, however, obtained a charter from Phoenix for the newer Amadea, purchased in Japan). Last week, however, Phoenix ended up posting bonds on both Club Cruise charters. First, the 508-berth Alexander von Humboldt II was arrested in Ijmuiden and then released when payments made by Phoenix. Then, the flagship Albatros was arrested in Gibraltar and once more released on the basis of payments made by Phoenix. Alexander von Humboldt II is now at the Bredo Werft shipyard in Bremerhaven and Albatros is expected there today. Both ships are to depart Bremerhaven for Christmas cruises on 20th December if negotiations to keep them in service are successful. Meanwhile, the long-term Phoenix charter Maxim Gorkiy, completed her last Phoenix cruise in Venice on Sunday. She was to have been chartered to the new Florida-based owners of Orient Lines as Marco Polo II but the relaunch of Orient Lines has now been put off until the world financial situation improves. This has led to speculation that Phoenix might once more be interested in taking her back, but it will not do anything to improve the high fuel consumption of the Maxim Gorkiy's steam turbines. Others speculate that Fred Olsen might be interested in acquiring the third of the Royal Viking trio, even if it means continuing to charter her to Phoenix. This is a most unlikely scenario, however, seeing as Fred Olsen have not only acquired the Balmoral recently but also stretched both the Balmoral and the Braemar, and they may well have expanded too quickly in today's market, even if the Black Prince is retired. Another recent Club Cruise purchase was the 500-berth Astoria, aqcuired just last year from Sovcomflot for charter back to Transocean Tours of Bremen. For several years Transocean had been operating the Astoria together with her near sister ship, the 590-berth Astor, both originally constructed in Germany for seasonal operation to South Africa. However, when Transocean decided not to renew its charter on the Astoria, arrangements were made instead to sell the ship to Saga of the UK. At first, she was to have been renamed Quest for Adventure and joined Spirit of Adventure in Saga's adventure division, but she is now to become Saga Pearl II, to replace Saga Rose, which does not meet new Safety of Life at Sea regulations that come into effect in 2010. Meanwhile, her last cruise for Transocean, her 2009 world cruise, was cancelled on November 22 after major engine damage was discoeverd during her last drydocking. This will take at least seven weeks to remedy. The agreement to sell the Astoria to Saga was arrived at in May. Others have proposed that if Transocean still needed a ship to perform this cruise the Maxim Gorkiy might be available. Still, once repairs are effected, Astoria will be ready in plenty of time for delivery to Saga, where, as Saga Pearl II, she is not due to undertake her first cruise until October 2009. Another very short-lived purchase by Club Cruise was the former fast ferry Finnjet, which Club Cruise acquired in November 2007 and had intended to covert into a cruise ship. With the credit crunch already taking hold in late 2007/early 2008, however, she was sold for scrapping in India in June. The End for Club Cruise? Starting with its own Netherlands-based cruise operation that did not gel, Club Cruise had its share of problems. Vision Cruises reneged on a charter on the Jules Verne, as the Alexander von Humboldt II was then named, in 2006/07. The situation with Travelscope did not help as first that company ceased trading and then the ship was twice detained on her return from her world cruise, which went ahead under Van Gogh Cruises. Nor did Van Gogh Cruises' difficulty in getting admission to the Association of British Travel Agents (ABTA) so that they could sell cruises in the UK market. The purchase and sale of the Da Vinci can only have netted them cash but resulted in a loss on her resale in a declining scrap market. The recently-published third quarter results speak of a difficult situation. From a profit of €11.9 million year to date this time last year, Club Cruise has moved to a loss of €13 million year to date in 2008. The largest single change is an increase in "selling, general and administration" costs from €1.2 million in 2007 to €18.5 million this year, an increase of fifteen-fold. Revenues had meanwhile increased by about 12% from €45.3 million to €50.9 million. As well, we now know that the 2008 sale of the Flamenco resulted in a loss of €9.5 million and that Club Cruise had been seeking further financing based on deferral of payments already due in a market where credit had become increasingly more difficult to obtain. In January 2007, Club Cruise had been able to issue 1,009,000 ordinary shares at a price of €7.50 each in order to raise €7,567,500 for the company's then expansion program. By last month, however, it was unable to raise finance in the usual ways and was forced into defaulting on loans. On 30th October, bondholders voted not to accept a request from Club Cruise to postpone payments due in 2009. On 3rd November, bondholders were informed that Club Cruise would not be able to meet its interest payment due 8th November. On 26th November, bondholders voted to give the trustee authority to commence the sale of Club Cruises' vessel and/or to declare the borrower bankrupt. Three bond issues are concerned, two for 2006/2011 at 8.5% and 8,75% and one senior secured issue for 2007/2012 at 5.25%, on which the interest payment was due on 8th November. Further news is now awaited. Or A Future for Club Cruise? The Club Cruise that is now in trouble is the same company that announced just last year that it was interested in building up to six new 20,000-ton cruise ships for its charter operations. In almost ten years of existence it has acquired some rather interesting ships and has had come successes but a lot of problems too. Nevertheless, it managed to achieve nett profits of €9.7 million on revenues of €44.9 million in 2006 and €9.8 million on revenues of €58.9 million in 2007. This year, however, will be far different. Club Cruise did bring an interesting approach to the market and the question is would there still be room for a successor operation in a market where V.Ships are strong and International Shipping Partners (ISP) are getting stronger? If the operation survives in any form, it would have to be in a different format to now. One basis might be Phoenix Reisen. Phoenix is not exactly a sister company of Air Berlin, now Germany's second airline after Lufthansa, and a profitable one at that, but Phoenix managing director Johannes Zurnieden is also non-executive chairman of Air Berlin. Still, that's neither here nor there. The real question is that, although successful, Phoenix does not want to own its own ships, but would it want to work with a revived Club Cruise? Otherwise, one might wonder who in today's market might be interested in acquiring a number of second-hand cruise ships.